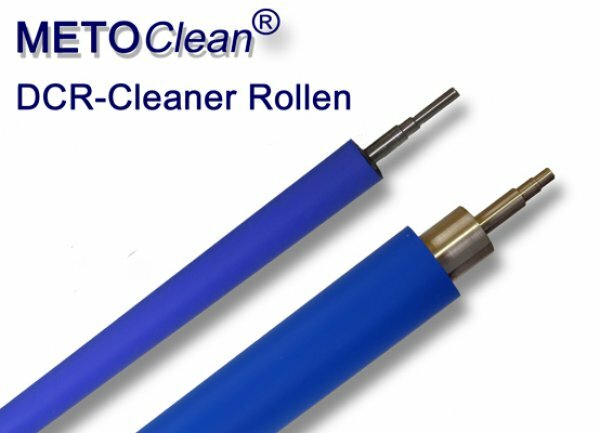 Original replacement wheels for panel cleaners (blue rubber rollers with self-adhesion) are usually very expensive spare parts. Asmetec's METOCLEAN elastomer rollers offer a significantly cheaper alternative to the well-known brand manufacturers from Scotland, USA or Asia. Not only that we can offer the elastomer rolls in different degrees of hardness and self-adhesion, but also antistatic rolls and rolls for films, foils and very sensitive materials are possible at Asmetec. In order to create an offer, we need the brand, the type and, if possible, the serial number of your panel cleaners, so that we can determine the exact matching roll data from our database. If these data are not available, you will find a form in the download area in which you can enter the dimensions of the required roles. The elastomer rolls are always made to customer order, the delivery time is therefore well over 6 weeks. When do elastomer rolls have to be changed? The durability of the elastomer rollers depends particularly on the stress during the cleaning process. For very coarse particles, e.g. in the glass industry or printed circuit boards with high CU requirements, the roller surface can be damaged quite quickly, for example, by cuts, scratches, particles that have broken out. For very flat surfaces such as films or foils, the durability is significantly longer.As soon as you notice damage on the surface of an elastomer roller, you should replace the roller. Damage to the surface leads to the further use that more and more rubber particles are dissolved out, a full-surface cleaning of your products is no more possible, even your products can be contaminated with the abrasion of the rollers. To keep the rolls working for as long as possible, you should inspect the rolls regularly, preferably daily, and remove any adhering dirt with IPA-soaked cleaning wipes. Under no circumstances should the rollers be cleaned with solvents, strong alkaline or acidic cleaning agents or with abrasive agents.